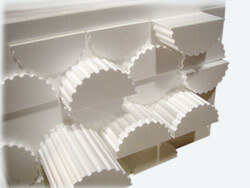 Foam Moldings will not rot and is highly resistant to mildew. Foam Moldings is safe for the environment, it neither contains nor uses chlorofluorocarbons or hydro chlorofluorocarbons in the manufacturing process. Each molding listed here has an individual page with lots of great information on it! Click on your desire molding or foam products to visit the page. What kind of Foam is used on our Moldings? Our foam moldings are made with Expanded Polystyrene (EPS), which is a closed cell plastic foam composed of hydrogen and carbon atoms. Billets of it are molded for us in different densities of one pound to two pounds per cubic foot. Polyurethane is a substance categorized as polymer based on its chemical structure. Polyurethane comes in different densities but it is also an incredible resilient, flexible and durable material that provides us with our great selection of Flexible Foam Mouldings and Shapes. EPS & Polyurethane shapes are lightweight, durable and temperature resistant. Eps foam & Polyurethane can be and is recycled into a variety of consumer and industrial products. EPS & Polyurethane has “class “a” flame spread rating” (25 or less), and a smoke developed rating of 450 or less. Foam Moldings is able to withstand the abuse of temperature cycling (freeze thaw) without loss of structural integrity or other physical properties, assuring long-term performance. What your Neighbors are Saying About Our Moldings? Fiberglass Mesh with Glue 38″ 4.3oz – 475 sf. Fiberglass Mesh 38″ 4.3oz – 475 sf. If you have any questions please contact us at (954) 917-4406. Prompt answers guaranteed! Here you can find download links for our credit application and credit card authorization form. Please feel free to call us in case you need additional help!